Siemens Home Appliances offer advanced materials, sleek lines and geometric shapes meet to form a refined and clear design language. Introducing you to a life full of endless possibilities. Please follow the link to learn more. Exceptional performance and artistic engineering by design. Every one of their pieces is conceived, designed and engineered, not just to the highest standards but to the Gaggenau standard. Use our advice to help you pick the best kitchen appliances for your kitchen including ovens, dishwashers, fridge freezers, washing machines and microwaves. 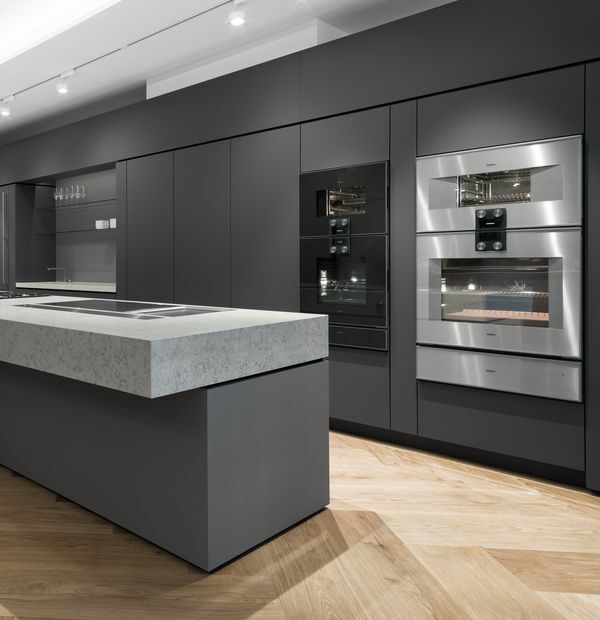 We purchase from a range of suppliers including Siemens, Neff, Gaggenau, Rangemaster and Falcon which we feel offer the best quality products on the market. Neff has a long proud heritage. Neff has tweaked, innovated and perfected. They are constantly monitoring innovation and are responsible for a number of new products and kitchen concepts. They use the best materials available to ensure their products perform to the highest standards and they are committed to improving energy efficiency and minimising water consumption. In the "twenty- tens", NEFF has turned to magic in the search for ever-more delicious ways to cook and like to think there's a little bit of magic in their latest innovations. Take Variosteam. During cooking, our Variosteam technology adds moisture to the oven (in the form of steam), meaning that roasts, for example, will turn out succulent and juicy every time (carnivores rejoice!). Another piece of kitchen sorcery is NEFF's Flexinduction hob. Just place a pan anywhere on its smooth, dark surface and only the pan heats up, whilst the rest of your cooking area stays cool to the touch. Rangemaster are the market leaders in range cookers and are famous for their style and functionality. They have a long history, stretching back over 200 years. A Rangemaster range cooker can benefit from being a bigger oven – two ovens if you prefer – including a multifunctional oven that can defrost, fan grill, brown and fan assist, with rapid response for faster heat-up times. They have a high-powered grill, a choice of gas, ceramic or induction hob, powerful wok burner and storage drawer. The range offers The Nexus SE from Rangemaster which offers a contemporary style cooker that delivers performance and scores high on its sleek design with triple cooking capacity, Falcon DeLuxe with its stylish design, combined with professional build quality and durability. Made from robust cast aluminium, each cooker also includes features such as a Teppanyaki Griddle, Handyrack, Multi ring Burner, Multi Zone, Rapid Respomnse and Telescopic Shelving. Ovens are the heart of the professional, as well as the private, kitchen. There are a multitude of striking and intuitive configurations available. For example, couple the combi-steam oven with the vacuuming drawer and add sous-vide cooking to your repertoire. Or complement your choice of oven with the warming drawer or combi-microwave oven. As the kitchen becomes a place for both cooking and entertaining, ventilation becomes more vital. The ventilation products capture vapours and odours from a collection of extractors, which can be controlled manually or automatically, mounted on the ceiling, on the wall, within cupboards, above islands or on the cooktop. A FullSteam oven - combines all the heating modes of a full-featured oven with those of a steam oven, in one single appliance. Ideal for fish and vegetables, nutrients are retained and food is left beautifully flavoursome. It’s easy to operate and also simple to refill the concealed one litre water container – press a button to open the front panel, remove the container, fill it and you’re ready to steam ahead. Pyrolytic Self-Cleaning Ovens - When you activate the pyrolytic self-cleaning cycle, high temperatures of up to 485C turn baking, roasting and grilling spatter and residue into ash. Once the oven has cooled you can simply wipe it away with a cloth. Single Ovens - There is a range of single ovens which neatly combine oven and control panel in a single appliance. Framed by stainless steel strips, these ovens are a great fit for almost any kind of kitchen. When it comes to the oven, you can choose between different features like our intelligent steam support VarioSteam ovens, or Pyrolytic Self Cleaning ovens. There is a cooktop for every space and each private chef. The versatility of flex induction, induction, gas or glass ceramic cooktops can be combined with downdraft ventilation and the more specialised electric grill, steamer, Teppan Yaki or deep fryer. Singularly or combined in the Vario models, all are crafted to inspire the private chef. They can be flush- or surface-mounted or compact and will transform the cooking space. With their frameless design, Ceramic hobs have a whole range of options with up to 17 power settings and can have expandable zones which cater for pots and pans in all shapes and forms. Some also have enhanced touch control panel provides full flexibility over your cooking. For some cooks, there's nothing like preparing meals with flames. Our gas hob range provides you with the tool you need, no matter if you want stir-fry or slow-cook. The gas hob allows you to adjust the flame just like on an electric hob, making cooking even easier. With a range of sizes available, hobs are ready for almost any kind of pot you can think of. The FlexInduction hobs allow you to move your cookware freely around on the hob. The pots are automatically detected and heat applied where it's needed. They put heat at your fingertips and a simple rotating motion allows you to set the temperature. Some offer a backlit interior that softly illuminates your pristine dishes and technology for improved drying performance. Dishwashers are available in two sizes, 45 and 60 cm, to suit individual requirements and the size of your kitchen. There is a range of dishwashers that provide clear communication via their TFT displays, as well as handle-free push-to-open doors, projection of the remaining wash cycle time onto the floor and clever loading options for large and precious items. There is a range of impressive refrigerators, freezers and fridge-freezer combinations offering multiple, separate climate zones and exceptional performance, thanks to the quality and precision of their cooling technology. An Airtight Crisper uses a special pane of glass to lock moisture in and maintain an ideal environment for produce. They clean and crisp laundry through innovative programmes and features. The new LED displays make it easier to use and addtionally the washers come in a range of efficiency and performance classes . Washer dryers are great space savers – the perfect solution if you want the functions of both a washing machine and dryer in a single machine. They are very easy and quick to handle and offer plenty of different helpfull features for your daily individual needs. Washing machines and condenser dryers are the first choice when it comes to fresh laundry and boast exceptional A+++ energy ratings, have large portholes with doors that open a full 180 degrees and spacious and, well-lit drums so you can load and unload easily. These washing machines offer an intelligent dosage system, while the dryer houses a self-cleaning heat exchanger, heat pump technology and anti-crease cycle. A fully automatic espresso machines allow you to prepare coffee to a professional standard within your home. You can create bespoke beverages to cater for the individual preferences of your guests, instantly and with a minimum of effort. These are coffee machines that blend seamlessly into our oven combinations providing streamlined perfection. Microwaves are a great way to introduce convenience into your kitchen. If you want to defrost and reheat your meal for a quick supper. Built-in microwaves fit seamlessly into your cabinetry. Depending on your chosen model, you'll enjoy handy automatic programmes that suggest ideal cooking times, a full-touch TFT display, or a Memory Function that allows you to select your favourite settings with just one touch of a button. Selected microwaves can also feature a grill. Ideal for smaller kitchens, these ovens with integrated microwave combine oven strengths – like roasting or baking – with the advantages of a microwave. It’s an appliance that looks just like a conventional three shelf oven inside. So, if you’re preparing your signature lamb tagine using frozen meat, and you’re a bit short of time, you can defrost the lamb swiftly using the microwave element. The handy FullTouchControl helps you choose the right time and temperature via the TFT display.